The wonders of Nyonya Peranakan cooking have always intrigued me. The Baba Nyonya or Peranakan people are descendants of Chinese immigrants who came to Malaya and adopted the Nusantara customs. 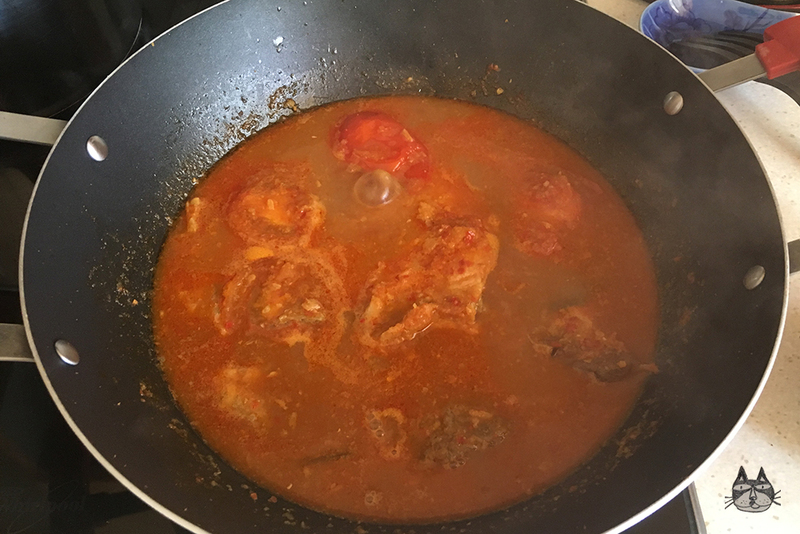 I had made a post about another type of Curry that I like – the Kapitan Curry, and this is another, but with no coconut milk. I was in Penang (aka Pulau Pinang) at the end of 2017, and I visited the lovely Peranakan Mansion in Georgetown, and I was awed by everything I saw there. I will write more about my trip to Penang in one of my travel posts in the next few weeks. 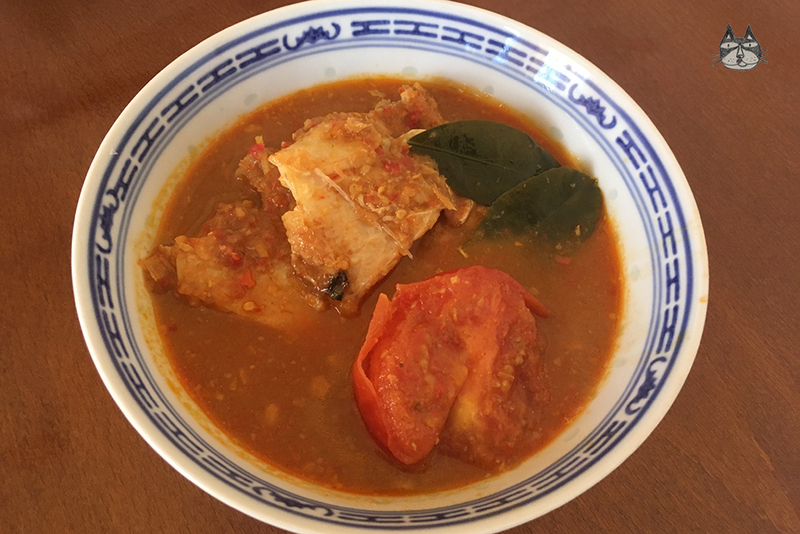 This spicy and sour fish curry, known in Malaysia as “Asam Pedas Ikan” is a wonder in the mouth – spicy, salty, sour and slightly sweet all at the same time. I do look for it when I go back to Malaysia sometimes, and I was not disappointed by my attempt at making this dish. 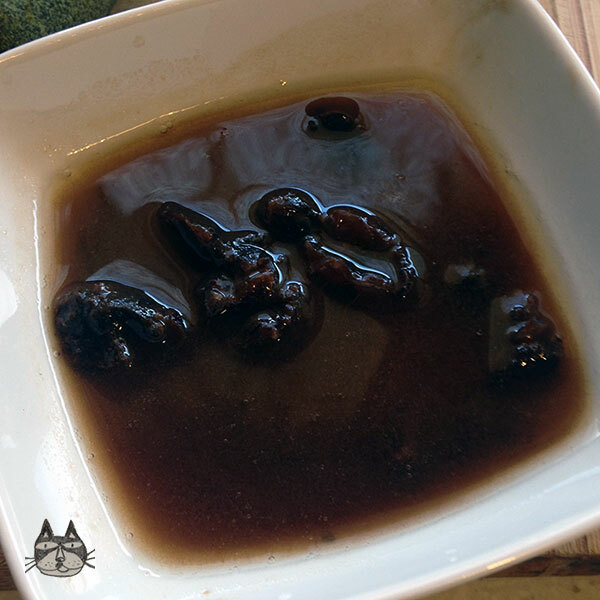 One of the ingredients that are important for this dish is of course the thing that gives it it’s sour and sweet flavours – the Tamarind. It’s easily found in Asian stores in paste form, either in a block packet or in a jar. Kaffir lime leaves gives it the extra fragrant kick to this curry, and the candlenuts gives it the richness that rounds up all the flavours together. You can use normal sugar, but I opted to use Gula Melaka because.. well, I had a lot in stock in my pantry. 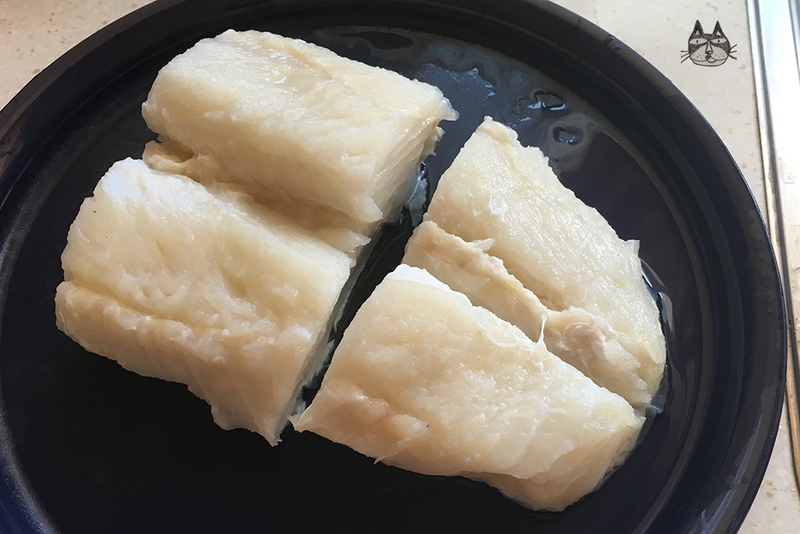 I opted to use Bakaliaros (Salted Cod) which you can read more about it here – the fish is full of flavour and requires a bit of preparation but I believe it is an excellent fish to be used in such curries and stews. Alternative fish that you can use are mackerel, stingray (this is a very yummy fish to use to make this curry!) or pomfret. You can use okra as well as tomatoes in this dish, but I didn’t have any fresh ones at hand. Belacan is another ingredient that is the ‘Marmite’ of South East Asian cooking – some people love it, and some just detest it. Read more about belacan in my Kapitan Curry post. It is totally optional, so if you don’t dare to use it, it’s fine. 2 stalks of lemongrass, and only the white part. First, prepare the curry paste. 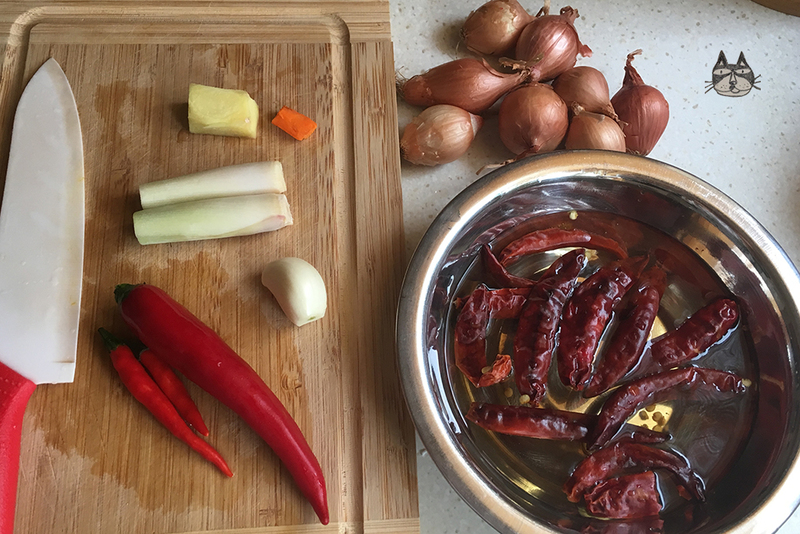 Clean the shallots, slice the lemongrass and of course de-seed the chillies if you don’t want it to be too spicy. 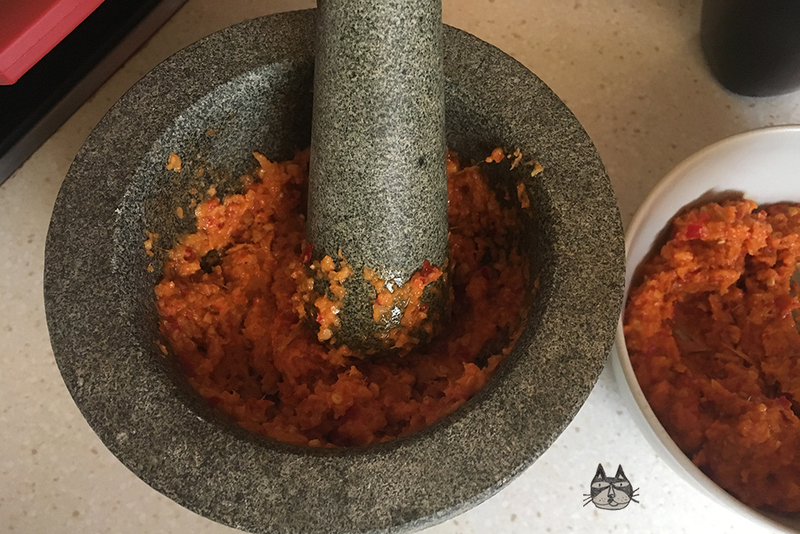 You can use a pestle and mortar (like me) or you can use a food processor too. If you choose the latter, just add the cooking oil in the mix so that it blends easier, and just fry it in the pot as it is, without any more oil. 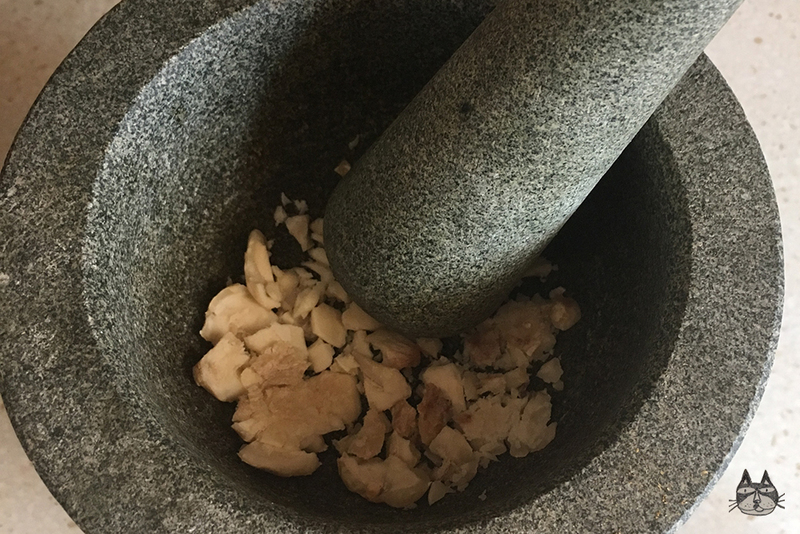 If using the pestle and mortar, start with the candlenuts. Gradually add all the ingredients bit by bit until you get a paste. Now that the paste is ready, heat up the pot. Add the oil and cook the paste until fragrant. Add the tamarind liquid and the water, and cook until it starts to boil. Add the fish, lime leaves and the pinch of sugar, and let simmer for 5 minutes on gentle medium heat. Add the tomatoes. Cook until the tomatoes get slightly soft and the fish is cooked through. Season to taste, and serve with rice. This serves 2 hungry greedy people, and there are other foods that you can serve this with – simple stir-fried vegetables goes really well!